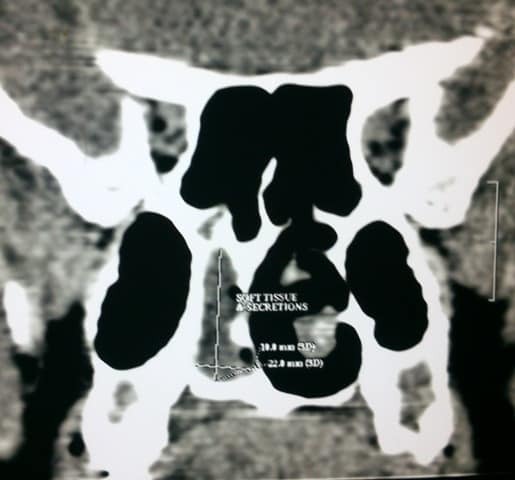 Choanal atresia is a narrowing or blockage of the nasal airway by membrane or bony tissue. It is a congenital condition, meaning it is present at birth. When the nasal airway develops, it starts at the level of the skin of the face, where two indentations develop. These pits become deeper and deeper and eventually connect with the oral airway above and behind the palate. If this canalization is incomplete, the result is choanal atresia. The cause of choanal atresia is unknown. Choanal atresia is generally diagnosed shortly after birth while the infant is still in the hospital. Babies with choanal atresia have difficulty breathing unless they are crying. Choanal atresia blocking both sides (bilateral) of the nose causes acute breathing problems with cyanosis and breathing failure. Infants with bilateral choanal atresia may need resuscitation at delivery. Diagnosis of unilateral atresia is by Endoscopy and CT scan. In bilateral atresia , the immediate concern is to resuscitate the baby if necessary. An airway may need to be placed so that the infant can breathe. In some cases, intubation or tracheostomy may be needed. Surgery to remove the obstruction cures the problem. Surgery may be delayed if the infant can tolerate mouth breathing. The surgery may be done through the nose (transnasal) or through the mouth (transpalatal). The choanal atresia can be repaired or opened with a surgical procedure. 70 to 90% of choanal atresia involves bone and the soft tissue covering the bone. Only in a small portion of cases is the narrowing composed of only soft tissue and no bone. There are multiple techniques that can be used during surgery, but most often an endoscopic approach is used. With an endoscopic approach there are no incisions on the face or the palate. The procedure is done through the nostrils. The bone and soft tissue that is blocking the opening is taken down until it is open to the area where it connects with the mouth. This area is called the nasopharynx. An “open” approach can be used in which an incision is made into the palate from the oral cavity to access the narrowing in the nose. 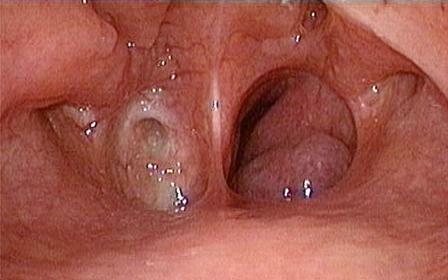 After the atresia is opened, the palate is then closed. In either case, endoscopic or open, a temporary stent may or may not be placed to keep the newly created choana open. It is possible that the opening may begin to close, with or without a stent. More than one surgery is often necessary to try to keep the nasal airway open. Here an older woman with unilateral choanal atresia undergoes endoscopic laser assisted choanal atresia repair.